Alfred C. Priestley school has been closed for over 20 years. 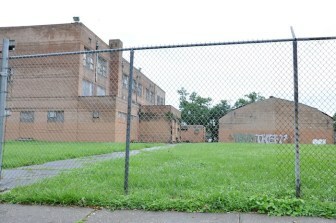 Now, Lycee Francais charter school leaders hope to renovate the Pigeon Town school and move in by 2018. Lycée Français de la Nouvelle-Orléans charter school is the proud new owner of a $425,000 fixer-upper that’s been empty for more than 22 years, and the neglect is apparent. Earlier this month the French-curriculum charter school bought the long-standing Alfred C. Priestley School from the Orleans Parish School Board. But Priestley won’t be ready for students this coming year — or anytime soon. The 77-year-old Pigeon Town school requires at least a $9 million facelift to be student-ready, and perhaps double that. Despite the grim condition report, Lycée CEO and Principal Keith Bartlett is hopeful the school can relocate to Priestley site in two or three years. He said the board is forming committees to address such things as vetting developers and plotting a vision for the campus. The 466-student school is currently split across two campuses and is adding fifth grade in the fall. Lycée’s founders envisioned a kindergarten through 12th-grade school, and it has been adding a grade each year. Lycée leaders used a $800,000 line of credit to purchase the building, Bartlett said. They will also draw from that line of credit to patch the roof at Priestley, secure the site and remove asbestos and lead while leaders form a long-term plan. But the cost to renovate Priestley will be much more than that. Previous estimates the Recovery School District received from Waggonner and Ball Architects in 2012 put renovation costs at a low of $9 million, up to $21 million for the full renovation plus an addition with more classroom space. After getting the estimates, the Recovery School District opted not to fix the facility. Bartlett has said Lycée is exploring options to finance the renovation, one of which is working with the Charter Schools Development Corporation. If Lycée uses CSDC, they would sell Priestley to the organization, which would finance the repairs, and lease it back from them. The 2012 facility assessment details masonry cracks and the need for a new water, fire protection, electrical and heating and cooling systems. Photographs show termite damage and old, likely hardwood, classroom doors with each of the 12 small windows broken out. The three-story, 32,000 square-foot school has a 6,500 square-foot gymnasium that was constructed in 1955, according to the report. Lycée is among the types of charter schools that aren’t guaranteed facilities by the state or School Board. And it has spent a significant amount of time and money scouting long-term homes while renting space. Other charters have recently purchased buildings. Encore Academy is working with CSDC to develop the Shaw school site this summer and plans to open there in the fall. Even schools that are given facilities have spent time on different campuses as the city rebuilds. Morris Jeff Community School moved into its permanent campus over winter break, its third home in five years. Lycée was granted a one-year probationary charter extension for the final year of its five-year charter from the state Board of Elementary and Secondary Education this school year. The probationary status was a result of ‘failing to meet expectations’ regarding its financial responsibilities. The school received 50 out of 100 possible points regarding its financial performance in 2013-14. Charter operators are typically granted five-year charters to start, which are reviewed and extended for one year during both the third and fourth years. In the fall, Lycée will go before the state school board for a charter renewal which could be up to anywhere from three to 10 years, based on the school’s academic performance.